Pinterest is fast emerging online service to bookmark and share interesting content across the web. Many users on Pinterest add content of their choice on different topics. Besides easy accessibility for users, it offers good exposure to content publishers. As a blogger, do you want to know – which articles or blog posts from your website got pinned by various users on Pinterest website? 1. 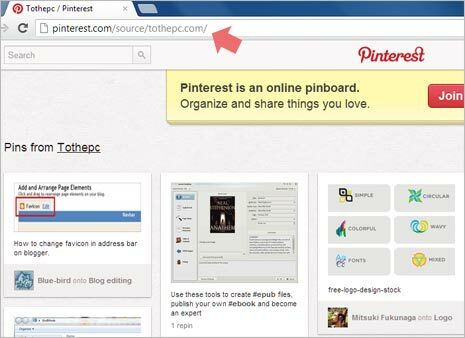 Just open this url: http://pinterest.com/source/tothepc.com/ to find listing of all articles pinned by different users on Pinterest website. Replace tothepc.com with your own website or blog url for specific information. 2. Scroll down and view complete listing of pinned articles from your website on Pinterest. This is very useful feature to get insights on which type of content from your website is popular and shared by Pinterest users. You can also explore under which categories your content is being pinned. You can find new user connections who have already pinned your content on Pinterest. You can use this information for your future content creation and expansion of social connections.